This is the second in a series of reviews about the *new* Young Animal imprint from DC comics. The first review about Cave Carson Has a Cybernetic Eye can be read here. 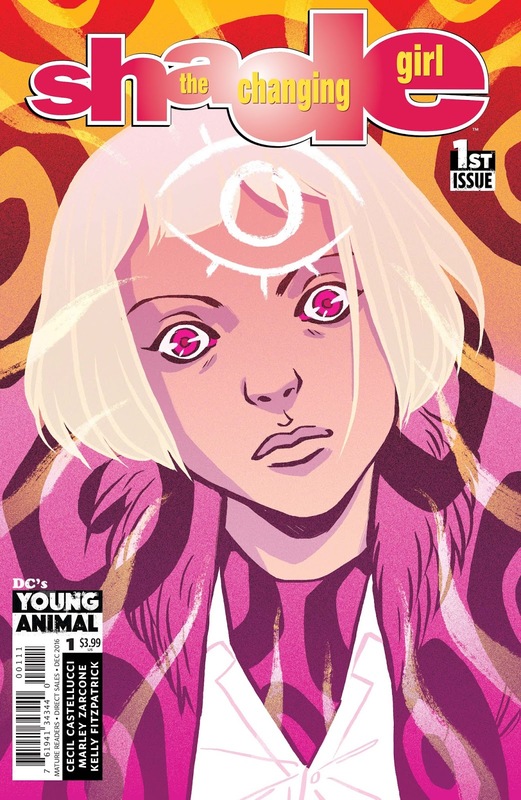 By the time you read this, Shade the Changing Girl v1 #1 will have been released a bit more than a year ago (hence the 'one year later' bit added to the title of this article). My interest in Shade the Changing Girl is two-fold. First, I have high hopes for the Young Animal imprint. I honestly believe that it has that 'punk/indie' feel that will bring new readers to DC comics -- especially with Gerard Way (of My Chemical Romance) at the helm. Secondly, I'm extremely curious to see how this series compares to Peter Milligan's Shade the Changing Man from the early 90s (which I loved so dearly). Since Shade the Changing Girl is a NEW character and will inevitably reference Shade the Changing Man mythos... I suppose I should provide some sort of brief history as to who Shade the Changing Man (aka Rac Shade) is, just in case you're a new reader and not familiar with this character whatsoever. Introduced in 1977's Shade The Changing Man #1 by Steve Ditko and Michael Fleisher, Rac Shade is an alien from the planet Meta who escapes to earth so he can clear his name for a crime he didn't commit. Thankfully, he didn't come to earth empty handed -- he sports his M-Vest (which grants him flight, a force field, and illusion-casting powers) in order to battle his way to the truth. 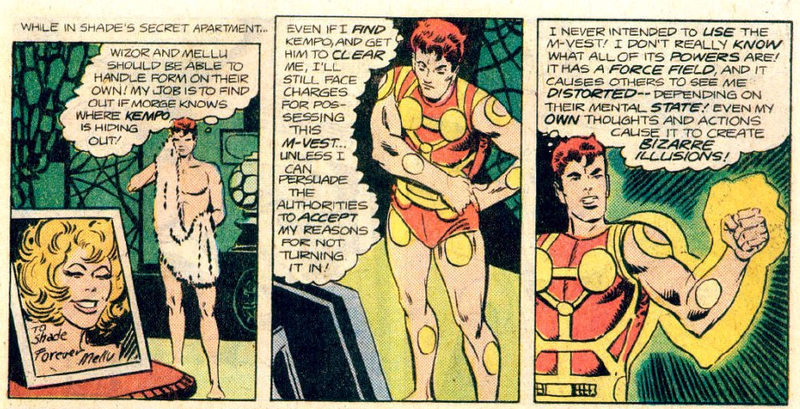 Shade the Changing Man #2 (1977). Art by Steve Ditko. The original 8 issue series from 1977/1978 was mainly a sci-fi action series. Rac was clean-cut and looked like a dead-ringer for Magnus Robot Fighter. 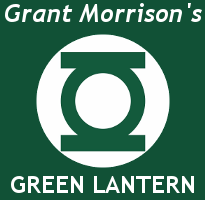 Unfortunately, this title was a victim of the DC implosion and was canceled before it could be concluded. 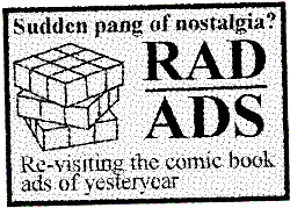 [well, it was actually resolved in 1978's Cancelled Comics Cavalcade #2]. Rac Shade would re-appear in the pages of John Ostrander and Kim Yale's Suicide Squad in 1988, joining the team for about two years' worth of missions, and then getting the 'Vertigo' treatment by Peter Milligan in his very own Shade the Changing Man v2 series. Rac Shade would later appear in DC's New 52 relaunch in 2011, and seemed to be following the same continuity that was established in the Vertigo series. By this point, however, he'd been absorbed into the mainstream DCU as a member of Justice League Dark -- alongside John Constantine, Deadman, Zatanna and Madame Xanadu -- which made him an active player in whatever major story arc was occurring in the New 52 Universe at the time. He left the series around issue #8 to wander into the sunset. I actually haven't read Justice League Dark, but it's written by Peter Milligan. so I'm willing to bet that this is why Rac stayed true to his Vertigo version. Ok, now that you're up-to-speed on Rac Shade -- let's move on to Shade the Changing Girl. From the very get-go I was interested in this title; I had read and enjoyed Milligan's Shade the Changing Man v2 when I was *much* younger, I still had fond memories of it, and I was walking into this new Young Animal title with an open mind. In short, it would take a lot to disappoint me. As I write this review, I'm wondering how much I can reveal without spoiling anything. I'll give it my best shot. Similar to Milligan's Shade the Changing Man, this series begins with an extraterrestrial force taking control of a human host's body. It's only a few pages later that we're introduced to Loma Shade -- the protagonist of this series -- and her cunning plan to escape the planet of Meta by stealing Rac's Madness Vest. Right away, the first issue introduces a few mysteries that quickly drive the story forward: Who was the comatose human host? Why was she brain-dead when Loma Shade hijacked her body? Why are people acting so nervous now that she's out of her coma? (She's just a teen-aged girl, after all.) There's also an established sense of urgency as it is quickly revealed that the authorities on Meta want the Madness-Vest returned. A great start for a first issue -- lots of things to keep a reader coming back for more. The art team of Marley Zarcone and Kelly Fitzpatrick strongly compliment the writing and mood of this series. Zarcone's pencils and inks are clean with very thin lines, there's not much shading, and kinda emits an 'indie comix' feel [which I totally mean as a compliment, because it works]. Fitzpatrick's coloring is filled with bright blues, greens, purples and pinks and keeps the illustrations vibrant. The panel layouts are easy for the eye to follow and, as a whole package, reminds me of Mike Allred's early Madman art -- and I'm a big of Allred's art, so that's saying something. So, how does this series tie into the legacy of Shade the Changing Man? Very efficiently. As Loma's idol, Rac Shade is elevated to mythical rock god status (think: Jim Morrison) and his poetic prose is often cited throughout the series. It's Rac's Madness-Vest that Loma ultimately steals to escape to earth, and it's Rac's former sweetheart, from 1977's Shade the Changing Man v1, who is revealed as the driving force behind the retrieval of the vest. While it references Rac Shade, I appreciate the fact that it's written in such a way that you don't need an in-depth knowledge of any volume of Shade the Changing Man to understand what's going on. 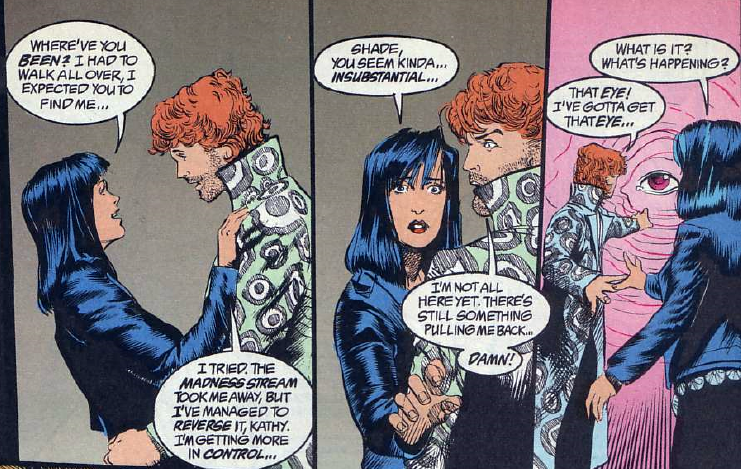 A major theme of this series (or at least the first six issues that I read) were Loma Shade's attempts to adjust to her new 'earth body' (i.e. introspection and self-discovery) and understand her new environment (i.e. navigating the social minefield that is high school). 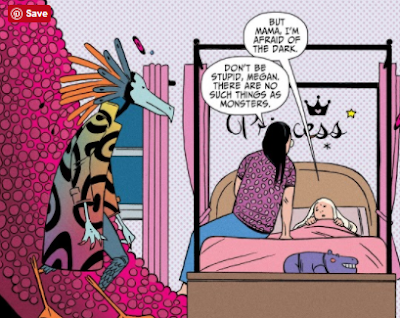 In that sense, Shade the Changing Girl reads like a coming-of-age story with elements of science-fiction mixed in. This is familiar territory for writer Cecil Castellucci (aka Cecil Seaskull) -- who is already an accomplished author and has penned several young adult novels such as The Queen of Cool, Beige, Rose Sees Red, First Day on Earth and Boy Proof . While this series had me hooked since issue #1, it didn't have that "holy crap this is the oddest thing I've ever read, yet I can sense there's a bigger message here" feeling I got from the first time I read Milligan's Shade the Changing Man [and, let's face it, that *is* a hard act to follow]. Shade the Changing Girl reads like young adult fiction with some mature ideas and some expletives thrown in, but don't confuse this as mindless teen drama targeted to a young adult audience -- thanks to Castellucci's writing, the characters have a lot of depth and you can't help but get wrapped up in it all. Shade the Changing Girl is a great read because it's NOT a shallow imitation of Shade the Changing Man. 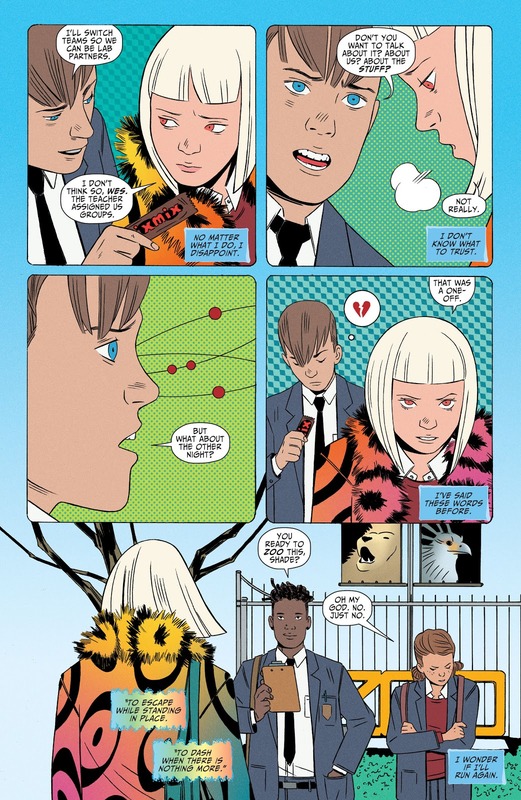 As explained by Gerard Way in the Afterword of the Shade The Changing Girl vol 1 TPB: "Loma Shade was born of a simple idea: she was to be an alien connected to Rac Shade in name only -- inspired by him and in possession of his madness coat. [...] In our first meeting, Cecil [Castellucci] responded to my drawing of Loma's alien body by immediately calling out, "She's a bird!" [...] As Cecil constructed a Loma that was every bit a free spirit as she was a fan of Rac Shade's poetry, we began to notice that Loma was a very different character than we had seen before." In summary, I feel that this creative team 'gets it'. This series captures the spirit of the Young Animal imprint -- it uses a previously existing DC character in a new and interesting way and it's an engrossing story with characters that a young adult reader can relate to. I eagerly await more Young Animal titles if this is the type of content they are producing. I'd recommend giving this title a shot if you haven't already. Start with issue #1 and work your way from there. I'd strongly recommend checking out the Shade the Changing Girl v1 TPB: Earth Girl Made Easy.